Captain John Mauger is the commanding officer of the Coast Guard's Marine Safety Center where he promotes maritime safety and environmental protection through review and approval of over 17,000 plans annually for the design, construction and alteration of U.S. and foreign vessels, equipment, and offshore oil and gas facilities. Captain Mauger has extensive experience conducting field operations and assisting government agencies with strategy development, resource allocation and succession planning. His immediate prior assignment was as the Coast Guard's senior technical authority for Design and Engineering Standards. There, he led interagency teams to promote Arctic safety and the use of alternative fuels as the U.S. Head of Delegation for development and adoption of the International Maritime Organization's Polar Code and the International Code for Gas-Fuelled Ships. 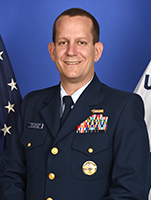 Captain Mauger is a Graduate of the Coast Guard Academy and earned Masters' degrees in engineering, from Worcester Polytechnic Institute, and national security, from National Defense University.